WSU researchers will share their work on cutting-edge agricultural advances with growers, agricultural industry professionals and crop consultants. 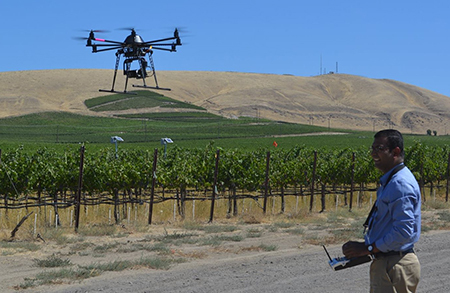 The event includes two presentations, “Drone-Data-Decisions in Agriculture” and “Precision Irrigation Technologies,” followed by demonstrations of energy-efficient precision irrigation and drone-based multispectral sensors. Dozens of displays and demos include robotic weeding and apple harvesting, intelligent in-orchard bin-managing systems, high-throughput crop phenotyping, precision pollination, mechanical pruning and more. Participants can interact with WSU researchers and provide valuable feedback both during the sessions and at a networking social at 5-6 p.m.
Agriculture Technology Day will be held at the WSU Irrigated Agriculture Research and Extension Center, 24106 N Bunn Rd., Prosser, Wash.
To learn more, visit the WSU Tree Fruit website.